We all love going on holidays, but it can be hard to say goodbye to your best friend. If your furry friend is a cat or kitten, holidays can be a particular challenge. Our beloved friends aren’t fond of a change of scenery. And, we can’t blame them, since a change of scenery usually means a trip to the vet, or being cooped up in a small cat kennel. 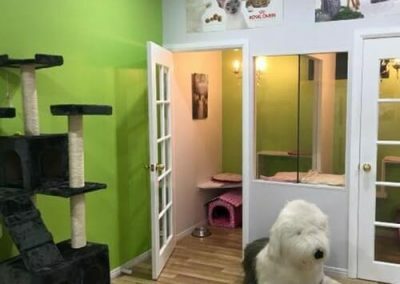 AAA Pet Resort’s cat boarding Gold Coast service could change their minds. When you bring your loved one to our caring pet hotel, they can enjoy their very own vacation. It’s a space designed especially for our fussy friends. Our cattery Gold Coast service goes beyond cat boarding. Your best friend will spend time with our cat sitting professionals, enjoying a scratch behind the ear or a friendly cuddle. 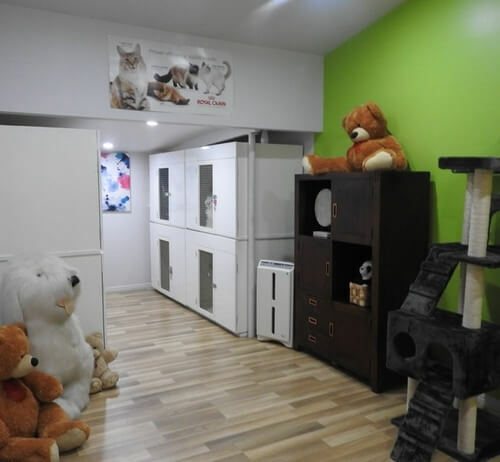 Every day, your cat will be loved and nurtured in this relaxing, attentive environment. 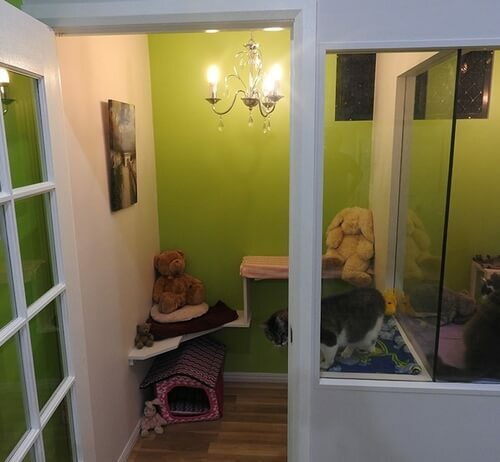 Just like your hotel room, our cat boarding hotel has many luxurious features. In our deluxe rooms, you’ll even find chandeliers and French shelves. Your loved one can play chase with catnip toys, get stuck into a scratching post or teddy, or jump up onto a high perch to enjoy the view. When it’s time for a nap, your best friend can retreat into a tiny house, savouring a small dark place that can make them feel safe. If your best friend loves to look outside, you might like to reserve our window room. Here, there’s an interesting view to enjoy. In every room, our pet hotel room service includes a litter change twice per day, as well as two room cleans that include replacing bedding and water. Dry food is available during the day, and a tasty wet food meal is provided each evening. Cat food is included in our standard price. 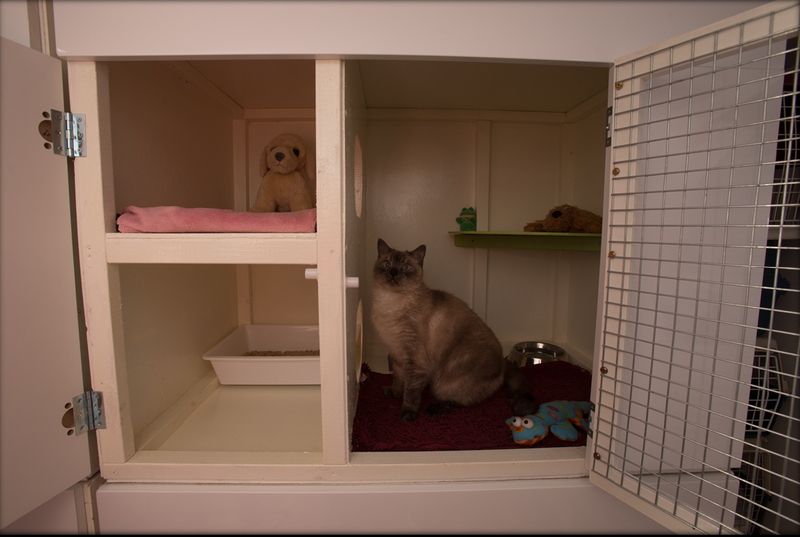 We know that our furry friends prefer their own space, so each cat boarding room is a separate place. If you have two guests staying with us, we can place them together or separately. We look forward to welcoming your best friend for a marvellous holiday experience. To learn more about our cattery Gold Coast service, simply get in touch. 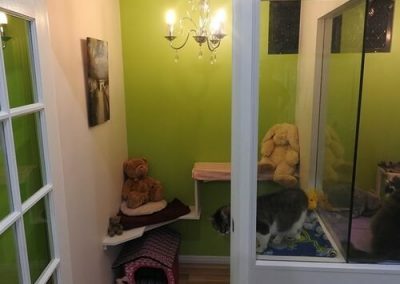 Constant access to dry food, wet food meals each evening, fresh bedding, blankets, toys, constant access to fresh drinking water, daily maid service, two daily play times each 20 minutes in length, complimentary brushing for bookings 5 days or more, private sleeping quaters, one climbing shelf. Recommended for single cats who enjoy relaxing most of the day. Constant access to dry food, wet food meals each evening, fresh bedding, blankets, toys, constant access to fresh drinking water, daily maid service, two daily play times each 40 minutes in length, complimentary brushing every five days, private slepeing quaters, French doors, large glass viewing window, three climbing shelves, chandelier. 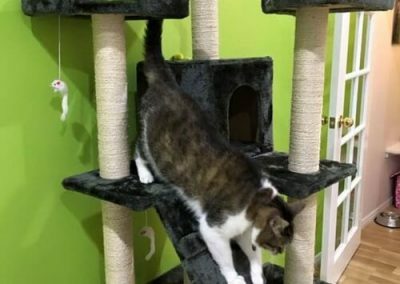 Recommended for family cats and/or cats who enjoy exploring and having ample space to play. In every room, our pet hotel service includes a litter change twice per day, as well as two room cleans that include replacing bedding and water. Dry food is available during the day, and a tasty wet food meal is provided each evening. These meals are included in the cost of the room. We know that our furry friends prefer their own space, so each cat boarding room is your pet’s own, not having to share with anyone else. If you have two guests staying with us, we can either place them together or separately. For cat lovers, having to leave them behind while you travel can be quite stressful. Pet owners often feel concerned or even guilty about leaving their pets with unfamiliar caretakers. 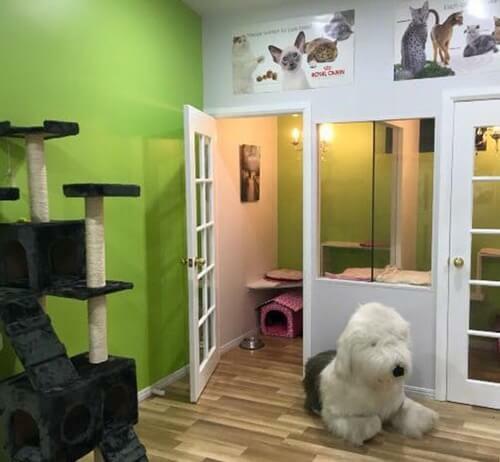 However, choosing a cattery on the Gold Coast where your furry friend is looked after with the same care and attention you would give them yourself can calm your nerves and ensure that your pet is safe and happy while you’re away. 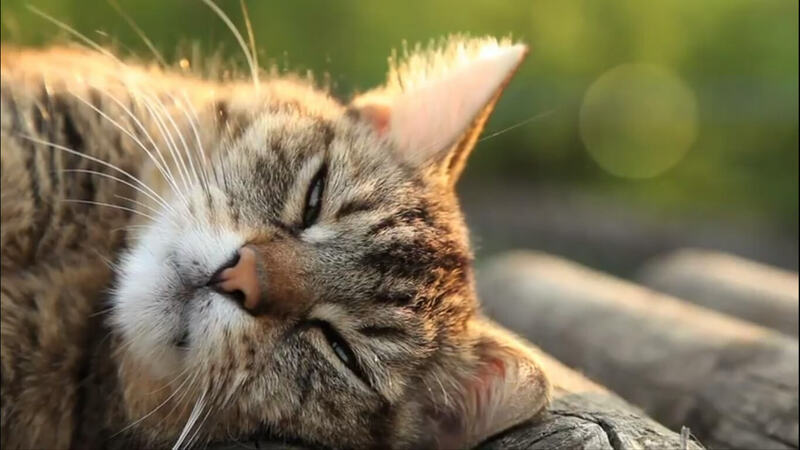 At AAA Pet Resort, we understand how difficult it can be to leave your cat but rest assured – we’re cat lovers, too, and we’ll do everything we can to make your cat comfortable during their stay. We’ll provide plenty of individual attention, regular feeding times, luxury accommodation, and more. However, you can start helping your cat have a good experience by doing a little preparation before they even arrive. Here are some things you can do before your trip to make sure your cat has the best experience possible. If your cat is a picky eater, you may want to bring enough of their preferred food to last the entire stay. Also, before you leave, avoid dietary changes as sudden variations in your cat’s food may result in digestive issues. When you’re gathering all the things your cat will need for their stay at a cat motel on the Gold Coast, don’t forget their medications as well as any special instructions the staff needs to know. You should also provide the contact information of your vet in case an emergency arises. Bring copies of your cat’s vaccination records as well. 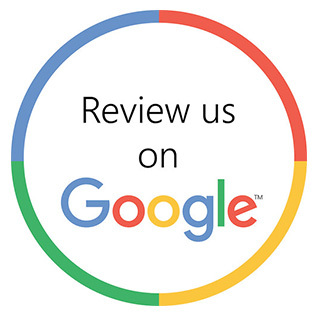 AAA Pet Resort is known for its outstanding service and care, and we are typically full – especially during holidays and weekends. Be sure to let us know how long your cat will need to stay with us so that we can provide the space, time, and attention they need throughout their stay. 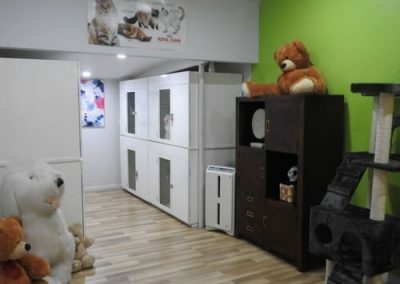 Are you looking for a cat hotel, motel, or boarding facility for a temporary stay for your furry friend? AAA Pet Resort can help. 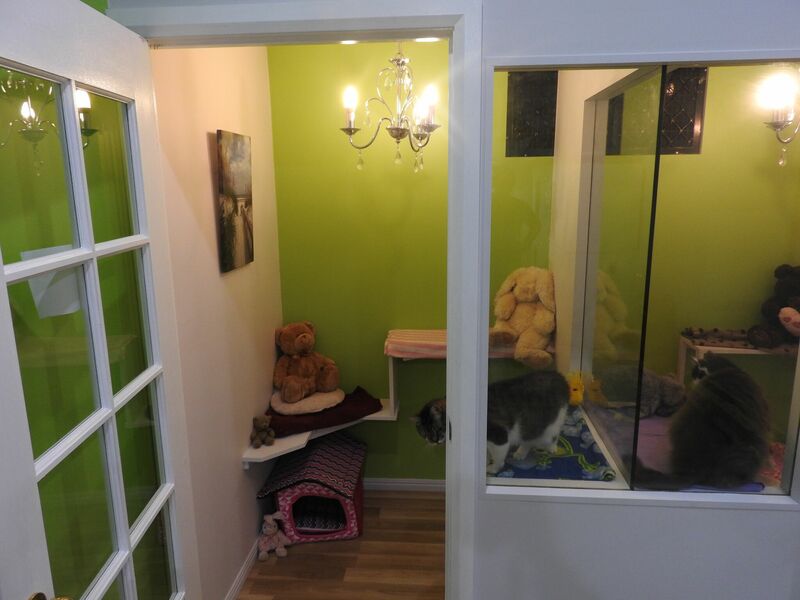 Our cattery goes above and beyond what you’d expect from a pet boarding facility. Here, your pet will spend time with our cat sitting professionals, who love lavishing your kitty with attention and love. 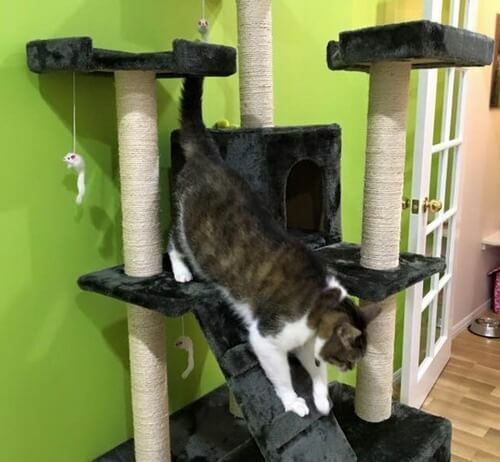 The relaxing environment and luxurious surroundings are perfect for your finicky friend, and we’ll provide plenty of fun amenities, from catnip toys and scratch posts to cosy beds and even chandeliers. There’s no better way to ensure that your cat spends your holiday or business trip in the lap of luxury – contact AAA Pet Resort today to schedule a visit or book a stay.